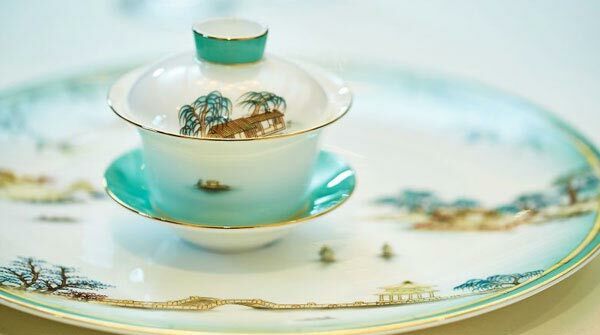 A set of tableware specifically designed for the G20 Summit welcome dinner in Hangzhou was inspired by the serene waters and beautiful natural landscape of West Lake. Soft yet solid strokes of traditional Chinese brushwork depict Hangzhou as it exists against an emerald green undertone. The team also took table settings into account. Appetizers will be presented on a dish covered with a dome-like cover, inspired by Three Ponds Mirroring the Moon, an attraction at West Lake. Tea at the dinner will be served in lotus-like ceramic cups, lined up gracefully on a bridge-like holder. The soup bowl is inspired by treasure ships on the Maritime Silk Road. The double layer design is also practical, preventing heat loss, thus preserving the full aroma and taste of the dish. Zhao Chunyang, the head of the design team, said they began working on the tableware in May, 2015. A total of 16 sets of designs were made. It took four months to design and create samples and 10 months to manufacture.